We recently went to Krabi, Thailand and I wrote about the first half of our holiday here. I had broken up our holiday into two parts with stays in two different hotels. After 5 days in our first hotel, we moved on to Holiday Inn Resort Krabi which was along Ao Nang Beach. We had a wonderful time in the first five days and on hindsight, I have to admit that moving from an awesome five star hotel to a good four star hotel is not sometime I would do in future. Maybe a move from four to five would be a better way to manage the holiday. The hotel itself is not bad, in fact, I have to compliment the staff who were amazing! The kids club was a real treat! It was definitely more engaging and exciting for the kids. The swimming pools were great as well with four different slides. On top of that, kids eat and stay for free! That meant that when we ate at the main restaurant for dinner, which we did on the first night, it was free for the kids. So I would say that Holiday Inn Resort Krabi is a terrific value for money option. It is a great four star hotel. The downside is that being a family oriented hotel, it can be a bit noisy and crowded. 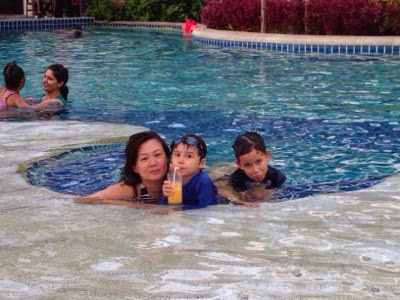 Here we are, enjoying the pool and the boy is having his mango smoothie while the girl pretends to make a face! The beautiful grounds featuring the swimming pool. This is taken from the hotel's restaurant where we had our breakfast. 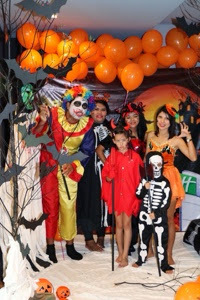 Kids having a fabulous time with the staff of the kids club for Halloween. 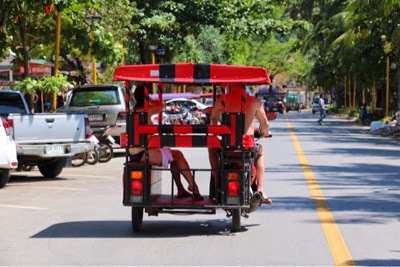 Getting ready to explore a little of Ao Nang on a tuk tuk. 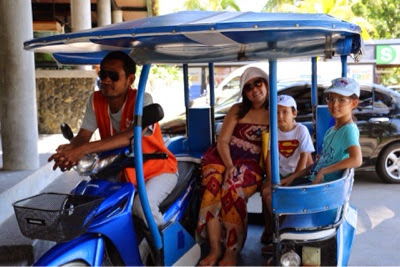 The kids loved going on the tuk tuk. Along the road, we noticed that one could even rent a tuk tuk and drive around by ourselves. 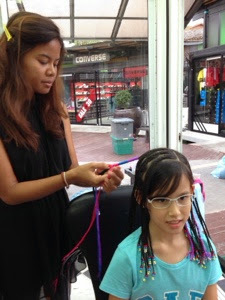 On of the favourite part of the trip for the girl was getting her hair braids done. It took an awfully long time though. All in all, about 90 mins for 30-40 braids. And during this 90 mins, the girl was chatting non-stop! And that takes us to the end of our trip. We took the budget airline, Tigerair, back to Singapore as they had a flight that leaves Krabi in the afternoon. It works out perfectly as we could check out at 12pm and arrange for a taxi to pick us up from the hotel and send us to the airport at around 1pm. Would I recommend going to Krabi? Definitely! Depending on what your preference is, I would say that both hotels are wonderful in their own ways. 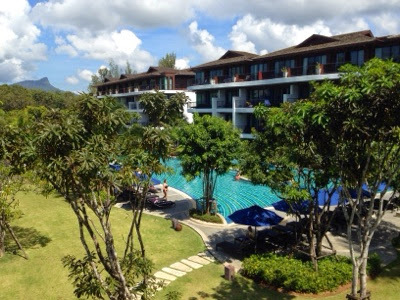 If you like nature and more peaceful, chill and relax type of a holiday, I would recommend Centara Grand Resort and Villas Krabi. It is a little pricey but worth the money. If you like to be in the bustle of activities, visit the town itself and walk around exploring the area, then Holiday Inn Resort Krabi would be a great option. It is easier on the pocket, in a great location and easily accessible. Wounderfull amily you have. I'm dream about my own children already, can't wait for it. I know that thai weman are very loyal, I were in that country this summer, have a work trip. I study this culture, and write a dissertation on this topic. When I was in Chiang Mai, I rent the motorcycle http://catmotors.net/mae-hong-son-loop/ to know much better this people. They are amaizing, even those boys, who are girls now. For some entertainment for my children I tried to visit your website to get information about children's gladness. I am interest to read best christian parenting books because I wanna change the ambience of my home by making my kids good individuals and such books assist me a lot to make positive changes.